While fighting and magic are central to the action in many of Saladin Ahmed’s stories, he never makes the mistake of letting his characters go to battle on empty stomachs. Whether the 2013 Nebula Nominee is describing a tavern’s spiked beer or the mess caused by thousand-layer pastries, food is an important part of Ahmed’s worlds, as seen in the collection Engraved on the Eye and in his first novel Throne of the Crescent Moon. Fresh from a recent NPR column on worldbuilding and fantasy, and the paperback and UK launches of his first novel, Throne of the Crescent Moon, Ahmed agreed to visit Cooking the Books to discuss his characters’ views on food, how food defines their societies, and six-foot tall warrior rabbit women. You had two debuts last year, Throne of the Crescent Moon and Engraved on the Eye. Several characters from Throne appear in Engraved on the Eye. The first time we meet Adoullah in Engraved on the Eye’s first story, “Where Virtue Lives,” he’s eating a thousand-layer pastry. In the process of eating, Adoullah gets the crumbs on his face and beard, but not on his robe. It’s an interesting way to approach a society by talking about the mess that food makes. Adoullah holds the office of ghul hunter, which, ages ago, was a vocation regarded as a holy order. Their signature garment is a white caftan that is magically white and can’t be stained. But Adoullah is one of the last of these guys and is a fallen, real-world version of a ghul hunter. He’s kind of a hero, but he’s modeled on a kinder version of the noir detective. We tend to stereotype those kinds of characters as amoral but it’s not true in many cases, like Dashiell Hammett’s Continental Op character. These characters try to do the right thing, even though they’re kind of grizzled, and they drink too much, and they might wake up too late. They might be socially on the margins, but they have a kind of purity to them that’s often in contrast to the world around them. Adoullah’s very much in that vein. So the thing with the robe and the food and the mess – there are a lot of scenes both in the novel and in the short stories of him eating, and eating very messily and loudly. The idea was to contrast this ideal of purity and what purity or virtue might really look like in the real world. So he’s got this moonlight white caftan that never stains, but he’s also messily wiping his hands on it and dropping crumbs because he knows he won’t get it dirty. What are Adoullah’s vices? Does he drink? He does – the world of the Crescent Moon Kingdoms is quasi-Islamic, but it’s a made-up world. The religion of that world – and I’m not a worldbuilder who shows every detail –is modeled on Islam in a lot of ways, but it’s also very different. The most religious characters in the books seem to be abstemious toward alcohol. They don’t drink, and kind of disapprove of others who do so. Even Adoullah isn’t a hard-drinking detective – tea is far more his vice than liquor. That’s very much a thing from Arab culture. Every culture has something or things that people consume socially in order to feel different. In Arab culture, that is much more tea and coffee than alcohol. Do the dervishes, like Rashid, eat? There’s really only one scene – a big dinner scene in Throne of the Crescent Moon, where Rashid eats. And even there, you don’t see Rashid eating much. He’s taking plain water. To his mind, alcohol is something he would never consume, and sweets also. They’re too “bodily.” But obviously, that’s not every character in the book’s position. That’s a contrast that you’ve drawn very subtly. There’s so much going on in the Crescent Moon Kingdoms stories that it’s hard to see, but you’ve set these two characters up to be the yin and yang of food. I guess that’s very true. Most of the other characters are maybe a little more in the middle. Adoullah’s first story, “Where Virtue Lives,” is a pre-story for fans of Throne of the Crescent Moon. This is the story of how Adoullah and Rashid got together. Which came first, the novel or the short story? 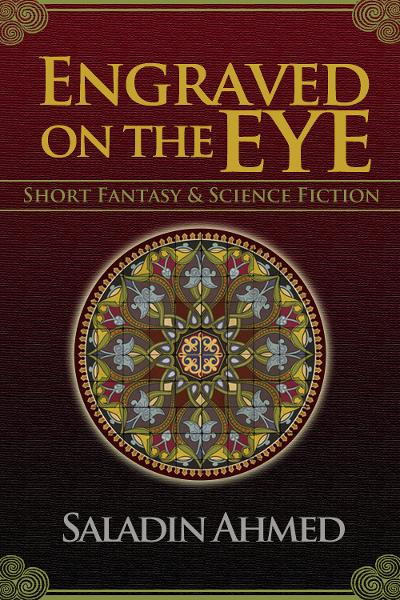 I grew up reading fantasy novels, and I wasn’t much aware of genre short fiction. I think I was representative of a whole class of people. In the ‘80s and ‘90s, a lot of fantasy fanboys were like me. They didn’t know about anything about the magazines the awards; they bought Tad Williams and Robert Jordan and books with covers similar to those books. I was very much in that mold. As a grown man with a much wider reading and publishing experience in literary fiction and poetry, I decided I wanted to go back to my roots and write a fantasy novel. I knew I would need a workshop of some kind because that had worked very well for me in the past. I looked online and I found a novel-focused workshop called Taos Toolbox, taught by Walter Jon Williams. Who is an amazing cook, by the way. * I attended his pro-level workshop, Rio Hondo, as well. That was wild because a different insanely talented and/or famous writer is cooking their dish. We had a lot of tasty food that workshop. When I went to Taos, short stories weren’t something with which I was particularly familiar. I took my bloated horrible beginnings of the novel with me, and I went over it with people and we talked about how to fix each other’s novels. And one thing people were repeatedly saying to me was, “You should write some short stories.” I knew nothing about the field. It hadn’t even occurred to me. But it made a lot of sense when people said it. So I went home from the workshop and wrote “Where Virtue Lives.” That was my first genre short story. It was written as a prequel to the novel. I knew these characters would be having x y and z adventures, even though the novel wasn’t done yet. “Where Virtue Lives” was published two years before Throne of the Crescent Moon came out. So in terms of publication history, it works very nicely as an introduction to these characters. You use food in other ways too – to talk about economic status. In “The Hooves and Hovel of Abdel Jameela,” the local tea room is merely the front room of someone’s house. In Throne of the Crescent Moon, you use food and access to food to describe economic and political status. M’Judrah, which is a rice and lentil dish. Ghallaba, which is like a vegetable and meat stew, made in a big pot. It’s fairly cheap to make. A lot of leftover bits. Stuff that when people were starving in the mountains in Lebanon. Back then, when they had leftover lamb brains? Sure, let’s make a sandwich. Now, even though people are not necessarily in that kind of dire circumstances, that food stayed in the culture. I can’t stand the tongue and brains aspect myself. Growing up, I also ate the same kind of junky food many working class American Midwesterners eat. Processed food. Fast food was the golden grail. McDonalds, tuna helper, all that kind of stuff. When I went to graduate school in New York, I saw what nicer restaurants are like and that the idea of locally sourced and organic is somehow appealing, along with more and organics being appealing along with more subtle flavors. You know, my wife and I for a big occasion used to do Le Bernadine or Danielle – all these epic New York restaurants. Not anymore. Stuff I can’t really afford to eat now that we have kids. So I probably do have a more social lens. I view a lot of things through a kind of class and demographic lens whether I mean to or not. It’s not surprising that it comes through in the books. I read the other day in my feed that McDonald’s, which tried Halal Chicken McNuggets in Detroit first is talking about taking them national. Oh that’s interesting! The McDonald’s by my high school was the first Halal McDonald’s. It is fairly uncontroversial around here that you’ll see Big Boy restaurants and other chains advertising Halal. But not everywhere. Really quick geek food question. You were part of an author’s game of Dungeons & Dragons at Epic Confusion 2012. What are your favorite snacks for tabletop gaming? I guess also Cheetos and Doritos. Doritos are the most stereotypical gaming food. I’m actually starting to rediscover junk chips after moving back to the Midwest. I lived in New York for eleven years – almost anywhere there, you can go into a bodega and get organic avocado oil tortilla chips or puffed rice with Vermont white cheddar. In Detroit, I’d have to make a bit more effort to get that kind of junk food here. And here, it’s also a little bit more socially acceptable to eat garbage. So I’ve kind of rediscovered things like Twinkies (before they went out of business) and Doritos and stuff like that. So the next time I tabletop game I might just bring a vintage-looking bag of Doritos. In your short story “Iron Eyes and the Watered Down World,” your characters are playing a tabletop game. And most importantly to the plot, they’re drinking beer. But they’re not eating anything. It doesn’t seem conducive to long-term game play to not eat, and this game has been going on for quite some time. What’s that about? I guess they’re hard-asses. Most hard-asses I know don’t tend to eat when they drink. I’m not a drinker. When I have beer occasionally, I want something like peanuts and pretzels. The people I know who drink as a recreation are just as likely as not to have food there. So I guess that’s — they’re trying to get drunk. That’s a very interesting game they’re playing in “Iron Eyes.” Did you make that up? I sort of pictured a couple pieces for it and didn’t think too much more about how it was played. It’s sort of like Mahjong with all the gorgeous tiles. Mahjong just looks like a game someone in a fantasy world should be playing. For someone who didn’t grow up with chess, they could say the same. The thing I like about that world is that it’s a kind of Conan pastiche. I basically said “What if I said it was ok to write these clichés?” The big hulking man and the priest with the spells. I guess giant rabbit woman isn’t a cliché. But the cool thing that came out of that is a second story in that world that I’m writing for Jonathan Strahan’s Fearsome Journeys anthology. Scott Lynch and Elizabeth Bear are going to have stories in there as well. It’s going to be great. Several of your stories, including Iron Eyes, involve animals and animal-human hybrids. Does this complicate what people eat around each other? The sidekick in “Iron Eyes” is a six-foot tall sword-fighting rabbit woman. I’m just now getting on to what the origins of her and her people are in the second story. I haven’t figured out whether she eats meat or not. Not a whole lot about the food and animals thing, but there are some things probably seeping out of my subconscious. In your stories, and especially in Throne of the Crescent Moon, You deal with the idea of urban-ness so well, especially with crowds and traffic. People come and go very suddenly and respect for each others’ boundaries gets to be sort of a political dance around rough edges. Because you’ve got so many different types of people coming together in your world, how do those rough edges get smoothed over with regards to food? Urban space and how people negotiate it and what kind of compromises you make and don’t has always been interesting to me. The question of naïveté versus savvy also comes into play. The Dervish Rashid in “Where Virtue Lives” can fight fifty people at once, but he just doesn’t know his way around. Adoullah is always teasing Rashid that he doesn’t know how to shop, or barter. Most things in markets didn’t have a price tag on them until very recently. That’s an invention of the twentieth century. Haggling is still the way in a lot of the world, and across a vast majority of the past. Adoullah knows that he can go out with this many coins and can expect to come back with this many vegetables of this quality. Rashid comes back with wilted half-full baskets of vegetables and Adoullah looks at him like, “You’re an idiot.” That says a lot about class and food and economics. I am hard at work on book two of The Crescent Moon Kingdom, and a little bit of book three. It’s unlikely the next book will be out in 2013 – more likely 2014. I do have several stories that will be coming out in two anthologies: Rags and Bones, retellings of classic tales, edited by Tim Pratt and Melissa Marr; and the sword and sorcery anthology Fearsome Journeys edited by Jonathan Strahan. Saladin, thank you so much for speaking with us today about food and your stories! 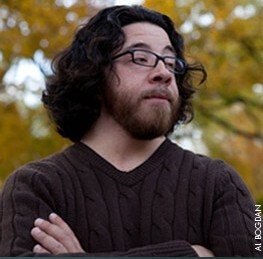 Saladin Ahmed was born in Detroit and raised in a working-class, Arab American enclave in Dearborn, MI. He holds a BA in American Culture from the University of Michigan, an MFA in Creative Writing from Brooklyn College, and an MA in English from Rutgers. His poetry has received several fellowships, and he has taught writing at universities and colleges for over ten years. 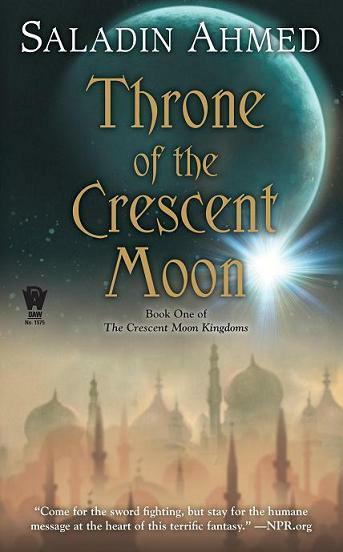 His novel Throne of the Crescent Moon is a 2013 Nebula nominee. His short stories have been nominated for the Nebula and Campbell awards, and have appeared in Year’s Best Fantasy and numerous other magazines, anthologies, and podcasts, as well as being translated into five foreign languages. He is represented by Jennifer Jackson of the Donald Maass Literary Agency. Throne of the Crescent Moon is his first novel. Saladin lives near Detroit with his wife and twin children. You can learn more at his website and follow him on Twitter. *Walter Jon Williams is indeed an amazing cook. He’ll be visiting Cooking the Books soon (we are holding his gazpacho recipe hostage). Read more Cooking the Books – The updated library of interviews is here. Previous Proof of Concept: Flying! Next Short and sweet: What’s in a Bio? I agree. Earthiness AND crumbiness… He’s a great character.